But we could not succeed in preventing certain false opinions from being adopted, especially in the schema on Religious Liberty, whose text was redone five times. Five times the same opinion was brought forward. We opposed it on each occasion. There were always 250 votes against. Consequently Pope Paul VI asked that two small sentences be added to the text, saying that there is nothing in this text which is contrary to the traditional teaching of the Church and that the Church remains always the true and the only Church of Christ. Then the Spanish Bishops in particular said: "Since the Pope has made this statement there is no longer any problem. There is nothing against tradition." If these things are contradictory then this little phrase contradicts everything, which is in the texts. It is a contradictory schema. We could not accept it. Finally there remained, if I remember well, only 74 bishops against. It is the only schema, which met such opposition, but 74 of 2,500 is little indeed! Thus ended the Council. We should not be astonished at the reforms, which have been introduced since. Since then, everything is the history of Liberalism. The liberals were victorious within the Council for they demanded that Paul VI grant them places within the Roman Congregations. And in fact the important places were given to the progressive clergy. As soon as a Cardinal died or an occasion presented itself, Pope Paul VI would put aside traditional Cardinals, immediately replacing them with liberal ones. It was Msgr. Pintonello himself who told me that he had translated the Protestant liturgical books for Fr. Bugnini, who at that time was but an insignificant member of a liturgical commission. He was nothing. Afterwards he became professor of liturgy at the Lateran. Pope John XXIII made him leave on account of his modernism and his progressivism. Hence surprise, surprise, and he is found again as President of the Commission for Liturgical Reform. This is all the same, unbelievable. I had the occasion to see for myself what influence Fr. Bugnini had. One wonders how such a thing as this could have happened at Rome. At that time immediately after the Council, I was Superior General of the Congregation of the Holy Ghost Fathers and we had a meeting of the Superiors General at Rome. We had asked Fr. Bugnini explain to us what his New Mass was, for this was not at all a small event. Immediately after the Council was heard of the Normative Mass, the New Mass, the Novus Ordo. What did all this mean? Fr. 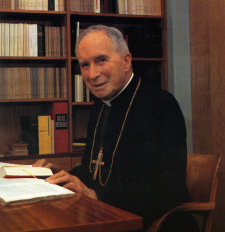 Bugnini, with much confidence, explained what the Normative Mass would be; this will be changed, that will be changed and we will put in place another Offertory. We will be able to reduce the communion prayers. We will be able to have several different formats for the beginning of Mass. We will be able to say the Mass in the vernacular tongue. We looked at one another saying to ourselves: “But it's not possible!"